There’s a reason WordPress is the most popular content management system. Its powerful feature set and flexibility separates it from other blogging platforms. And one such feature is the ability to create, manage, and display custom post types. Custom post types are special posts in WordPress that let you define a new structure for different types of content. They make it easier for you to upload content and let you fine tune how it appears on your site’s front-end. In this post, we’ll walk you through a step-by-step tutorial on how you can create custom post types in WordPress using the Custom Post Type UI plugin. We’ll also run the rule over four of the best plugins to help you get started with creating and managing custom post types. Let’s put everything into context before we begin. What Are Custom Post Types in WordPress? WordPress posts have a number of different parameters associated with them. They define the post’s properties such as whether or not readers can comment on it, is it hierarchical, or if it has a featured image. In its simplest form, custom post types are nothing more than WordPress posts with modified parameters. Want to increase your site’s readability and stand out in the crowd? Learn all about using custom post types in #WordPress! Courses on online learning websites. Property listings for real estate websites. Reviews for books, movies, and TV series. In most cases, different post types have different parameters associated with them. The default post type in WordPress, for example, lets you add the author’s name, the date the post was published on, and multiple taxonomies. 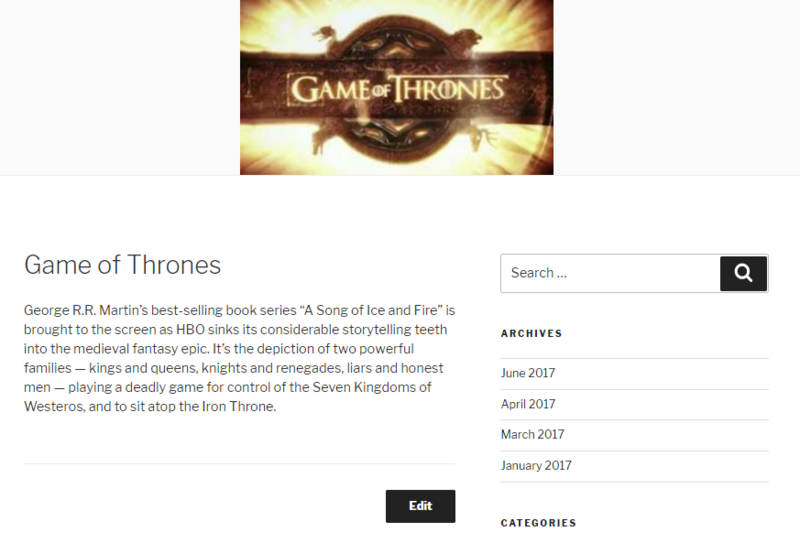 However, if you wanted to create a custom post type for reviewing TV series then chances are you’d like to specify the series’ genre, number of seasons, episodes per season, rating, writers, and main characters. With that little bit out of the way, let’s take a look at how you can get started with creating custom post types in WordPress. In this section, we’ll walk you through the four steps you need to follow to get started with custom post types in WordPress. By the time you’re done, you’ll have created your very own custom post type, added a new post, and published it to your website. To get started, log in to your WordPress website and navigate to Plugins > Add New from the admin panel. From the Add Plugins screen, search for Custom Post Type UI. Once you’ve found the plugin in the search results, click the Install Now button. After the plugin is installed, click the Activate button to proceed. With the Custom Post Type UI plugin installed and activated to your WordPress website you can begin creating custom post types. You’ll notice that a new menu item – CPT UI – has been added to your admin menu. Navigate to CPT UI > Add/Edit Post Types to add a new custom post type. Post Type Slug. Enter your custom post type’s slug in this text field. For the purpose of this tutorial, we’ll go with tv_series. Plural Label. The label you enter in this field will be used for the custom post type in the admin menu. Singular Label. This label will be used in all instances where a singular label is needed. Once you’re done adding the basic settings, click the Add Post Type button to continue. If you’d like, you can also configure the Additional labels and Settings. At this point, your new custom post type should be added as a menu item to the admin menu. Following our running example, TV Series has been added to the admin menu. Now, you can begin adding content to your custom post type. For the purpose of this tutorial, we’ll add a title, a description, and a featured image. Be sure to save the custom post as a draft once you’re done. Once you’ve uploaded your custom post, you can proceed to publish it to your site’s front-end. 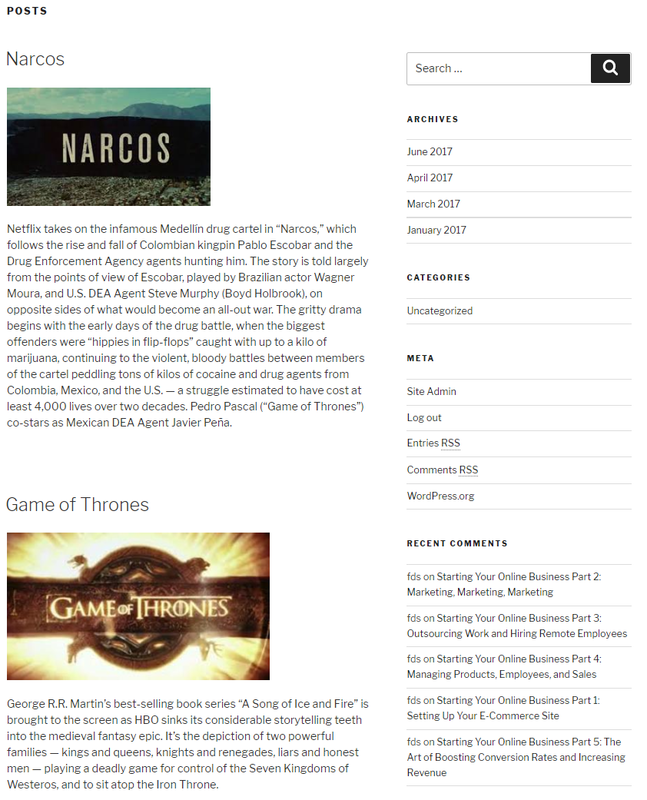 All you have to do is navigate to TV Series > All TV Series and open up the custom post that you’d like to display. What Are Some Other Plugins I Can Use to Create Custom Post Types? 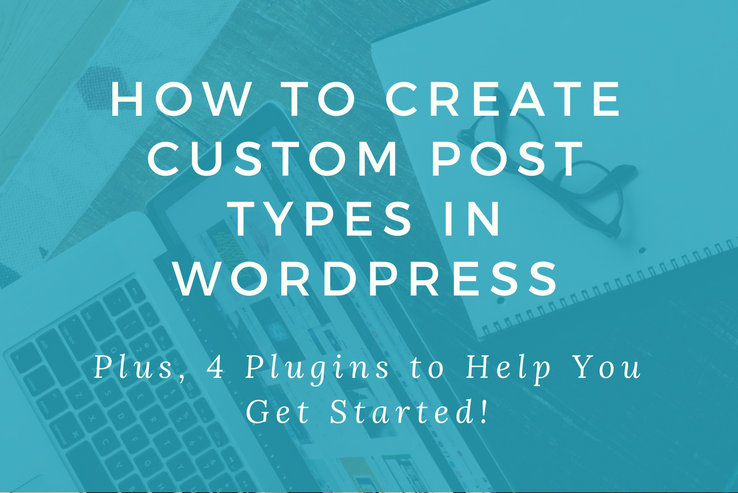 Although you can create custom post types in WordPress manually, using a plugin will save you a bunch of time and take all the heavy lifting out of it. Those of you who aren’t particularly technically inclined should opt for the plugin route instead of the (much lengthier) coding approach. In this section, we’ll run the rule over four of the best, free custom post type plugins for WordPress and highlight their standout features. 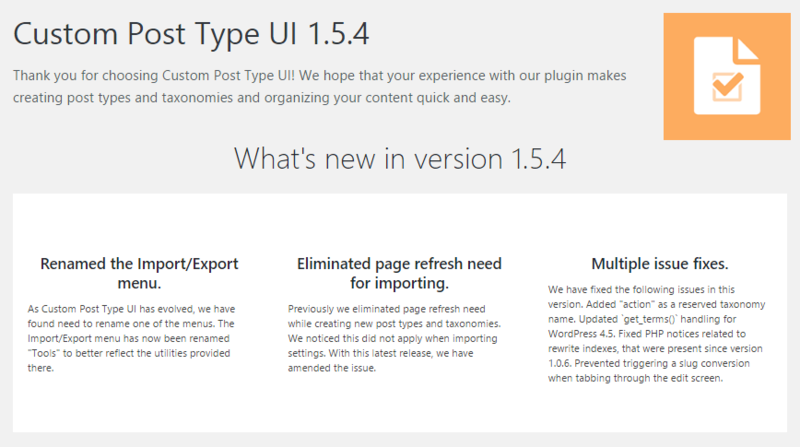 Custom Post Type UI is one of the most popular plugins in the WordPress Plugin Directory for adding custom post types and taxonomies to your website. Its user interface is incredibly user-friendly and intuitive to navigate through. Once you have the plugin installed and activated, you can begin adding custom post types in a few simple steps or import them from a previous installation. 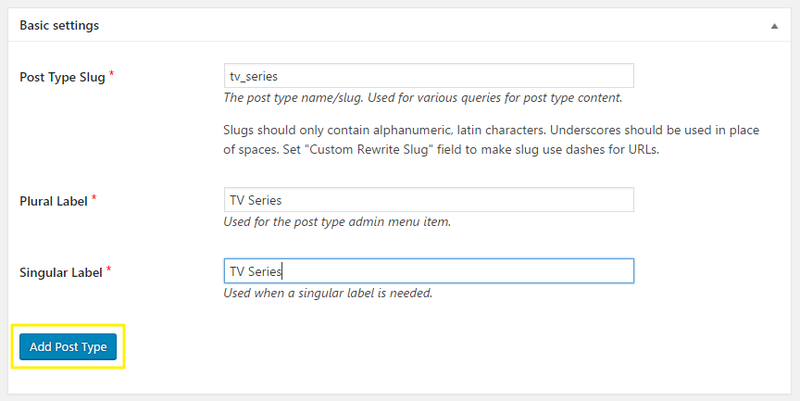 The Custom Post Type UI plugin registers new custom post types for you once you enter its basic settings. That said, you do have the option of adding additional details and configuring advanced settings. Intuitive, easy to use interface. Allows users to register and manage custom post types. Allows users to register and manage custom taxonomies. Toolset Types is a feature rich WordPress plugin that enables users to add custom post types, custom fields, and custom taxonomies to their website. The standout feature on offer with this plugin is that it features an intuitive user interface for non-coders and a comprehensive fields API for developers. After you’ve registered a custom post type using the Toolset Types plugin you’ll have the option to use its built-in advanced settings panel to fine tune its settings. The Toolset Types plugin gives you full control over your custom post types and even allows you to associate taxonomies with them. In addition to this, you also get integrated control over how custom fields are displayed for different custom post types. Intuitive, user-friendly graphical user interface. Allows users to add custom post types, custom fields, and custom taxonomies. Comes with complete documentation to help you get started. The Pods Framework enables users to manage all of their custom content needs from a single platform. The plugin makes it easy for users to create and edit their own custom post types or extend the custom post types that come with other plugins. In addition to this, you’re also able to display your content using shortcodes and widgets. In addition to this, the Pods Framework plugin also lets you create connections between your custom post types and other content to organize it better. It also lets you define how your content type functions using the intuitive back-end. Allows users to create custom post types, custom taxonomies, and custom settings pages. Makes it easy to extend and manage existing post types. Comes with lots of options to display the custom post types on the front-end. The Custom Post Types and Custom Fields Creator plugin lets you create and edit custom post types and custom taxonomies from the admin user interface. It comes with advanced labeling options from the get-go making it infinitely easier to get started with creating custom post types in WordPress. One of the standout features on offer with the Custom Post Types and Custom Fields Creator plugin is that it enables users to associate existing taxonomies or custom taxonomies to custom post types in order to organize the content better. Allows users to create custom post types, custom taxonomies, and custom fields. Comes with advanced labeling options right out of the box. Leveraging custom post types in WordPress allows you to give your content some structure, improve its readability, and make it visually appealing. What’s more is that you can dive into its advanced settings and configure the features it will support. Install the Custom Post Type UI plugin to your WordPress website. Create a custom post type by entering its basic settings. Add a new custom post and save it as a draft to your site’s back-end. Display the custom post on your website’s front-end. Do you have any questions about creating custom post types in WordPress? Let us know by commenting below! From C++ to PHP, the language Maria thinks in is code, and translates it to English for humans to understand. She has a degree in Computer Science and is the writer of choice for many organizations. She is also The Big Boss at BloggInc., calling all the shots and personally supervising every word and piece of content. In her spare time you can find her playing GTA V, lounging at the farm, or trying to beat her husband at indoor badminton.